City of Coconut Creek, Florida – Junior Achievement of South Florida announced today that it has received a $5,000 grant to fund its work readiness and financial literacy programming. 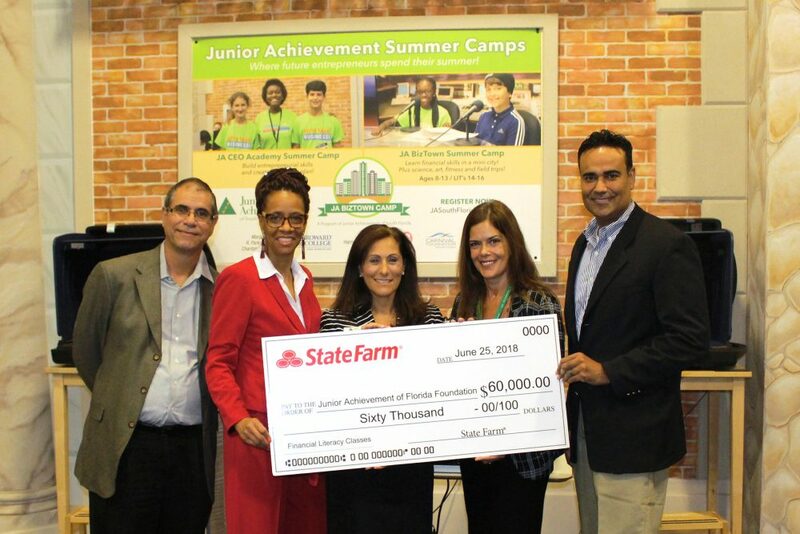 The grant, from State Farm Insurance, is part of a larger statewide initiative totaling $60,000 that will support Junior Achievement programs in 11 localities throughout Florida, enabling over 5,000 young people to participate in Junior Achievement’s nationally recognized economic education programs. “Junior Achievement programs benefit all students,” shares Jose Soto, State Farm Public Affairs Specialist, “however, Junior Achievement targets schools with a high percentage of low to moderate income students because they are more likely to derive greater benefit from the programs.” “Since 2014, State Farm has invested $205,000 to support JA financial literacy programs across the State of Florida”. Locally, the $5,000 allocation of State Farm funds to Junior Achievement of South Florida partially funds 330 at-risk high school students with Personal Finance and JA Career Success programs. The check presentation occurred in the Dave and Lorraine Thomas JA BizTowns at JA World Huizenga Center at the Lillian S. Wells Pavilion on June 25. Pictured (left to right) are: Jose Soto, State Farm Public Affairs Specialist; Tina Teague, President of Tina Teague Insurance Agency Inc. at State Farm; Laurie Sallarulo, Junior Achievement of South Florida President and CEO; Gina Griffin, Grants Manager; and Raul Despian, State Farm Agent. Junior Achievement of South Florida (JA) inspires and prepares youth to succeed in a global economy. JA provides real-world training in financial literacy including budgeting, spending, investing and the use of credit; offers cutting-edge skill-building opportunities that enable young people to explore meaningful, productive careers; teaches students how to start businesses; and introduces entrepreneurial values that strengthen workplaces. Last year, with the help of over 7,000 trained corporate and community volunteers, JA delivered over 20 various programs to almost 50,000 students in classrooms throughout Broward and South Palm Beach Counties and at JA World Huizenga Center at the Lillian S. Wells Pavilion on the Broward College North Campus, a first-class facility housing JA BizTown and JA Finance Park. For more information about Junior Achievement of South Florida, visit www.jasouthflorida.org.